Microsoft recently announced an Office 365 adoption content pack for Power Bi. 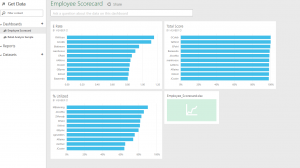 This content pack can be used to create a Power BI dashboard to help Office 365 administrators understand how their users interact with Office 365, by tracking usage and collaboration across apps. Tracking app usage in Office 365 isn’t new but putting the information into a Power BI dashboard makes it much easier to see and interact with the data so you can use it to make decisions. Two of the best uses for this data are to guide your user training and to determine if your users are in the right licenses. If you are like me, reports are boring. Like it or not, I don’t have a long enough attention span to dig into the details of text based reports. I want a quick snapshot of how we are performing so I can quickly zero in on trends or problem areas.